The Digi DC-782 is a low cost counting scale that offers practical solutions for a full range of counting applications. Its counting resolution of 1/500,000 gives you maximum counting precision and accuracy. Its backlit LCD display enables operators to easily see weights and quantities. 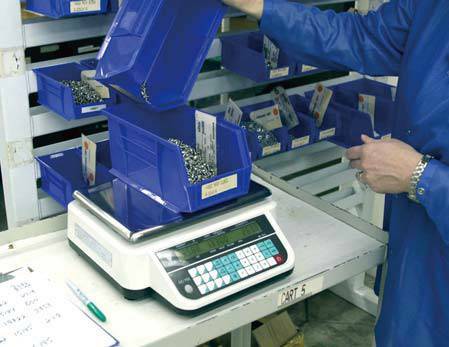 The DC-782 is a low cost electronic counting scale that offers practical solutions for a full range of parts counting applications. Its counting resolution of 1/500,000 gives you maximum counting precision and accuracy for the investment. Its backlit LCD display enables operators to easily see weights and quantities. 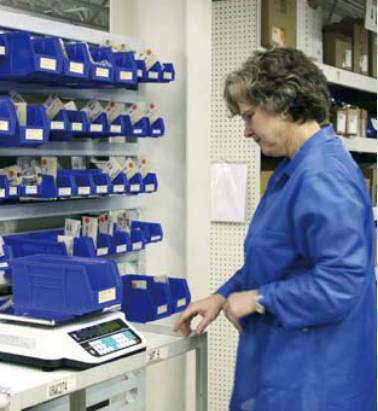 The DC-782 parts counter can also store an item code, tare weight, unit weight, and setpoint value for 25 of your pieces, parts, or items and recall 10 of them with the pressing of a single pre-programmed key. The RS-232 output allows you to transmit data from the scale to a PC. When portability is required, choose the battery operation option of the DC-782 for over 300 hours of continuous use in mobile workstations, outdoor applications, and rental fleets. The DC-782, available from Central Carolina Scale, is rugged enough to operate reliably in many environments and withstand transport from one area of the plant to another or from one business to the next. See DC782 scale manual for more in depth information about how the scale works. 1.Isolating the sample used to calculate the unit weight and use the same sample to re-check the scale. 2.Recalculating the unit weight from lot-to-lot of parts. Parts manufactured on one machine may vary slightly from another machine relative to weight. 3.Tightening the manufacturing tolerances on the parts reduces piece weight variations and increases count accuracy. Parts can vary greatly in their value. With parts of lesser value per piece, the extra sampling and time involved in trying to achieve 100% accuracy as opposed to 99.5% may not be cost-effective. However, with high value items, 100% accuracy is vital. The DC-782 Counting Scale has the precision to help you with both situations. Unit weight operation by sampling is accomplished by placing a 10 piece sample on the scale and then pressing the PIECES key. 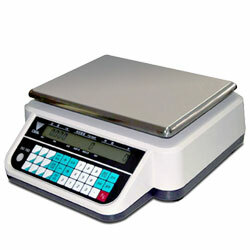 The scale calculates a unit weight based on the capacity of the scale compared to the weight of the sample. If you wish to use a sample of more than 10 pieces, place the sample on the scale, then input the sample size before pressing the PIECES key. •You can add pieces to the sample (keeping track of how many you add) until the INSUFF lamp goes out Key in the new total sample quantity and press the PIECES key. The scale will compute and display the unit weight. •If you press the PIECES key while the INSUFF lamp is lit, the scale will show the word ADD in the Unit Weight display and a number of pieces to add in the Quantity display..
•Add exactly the suggested number of pieces shown to bring the sample up a weight that allows calculation of a more accurate unit weight. The Quantity display will go down to zero, then press the PIECES key. The scale will recompute and display the total weight in the Weight display, the unit weight per thousand in the Unit Weight display, and the number of pieces in the Quantity display. You can ignore or override the INSUFF indicator by pressing the PIECES key again without adding more pieces to the sample. However, it may affect counting accuracy to use a Unit Weight calculated on the basis of an insufficient sample. If you do press the PIECES key again, the scale will compute and display the unit weight based on the original sample you gave it. If the RECOMP indicator is lit, the accuracy of the unit weight computation can be improved by adding approximately double the number of pieces currently on the scale and pressing the PIECES key again. The scale will flash as it recomputes the unit weight, after which it will display the new Unit Weight. P/N .............. Model .....................Cap x Readability .................................... Ship Wt. Consult factory for kg unit models.